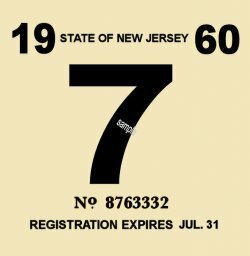 1960-61 NJ COMMERCIAL Inspection Sticker - $20.00 : Bob Hoyts Classic Inspection Stickers, Add a Final Touch to your Restoration! This 1960-61 New Jersey commercial sticker is 2 1/2 inches on each side. It is for small or large non-passenger vehicles. This sticker has been digitally restored and reproduced identical in size and color both front and back. It has our patented "Peel and Stick" feature that allows you to attach it to the inside of your windshield.